Just like the Decepticons in the Generations line with Soundwave and all of his minions, the Autobots get their Generations counterparts remolded and repainted in the forms of Blaster & Steeljaw, Eject, Rewind, Sunder, and Ramhorn. Just like FoC Soundwave, Blaster can store & eject data discs in the form of his little Autobot buddies, who all made their first G1 cartoon appearance in the 1986 movie, with the exception of Sunder. 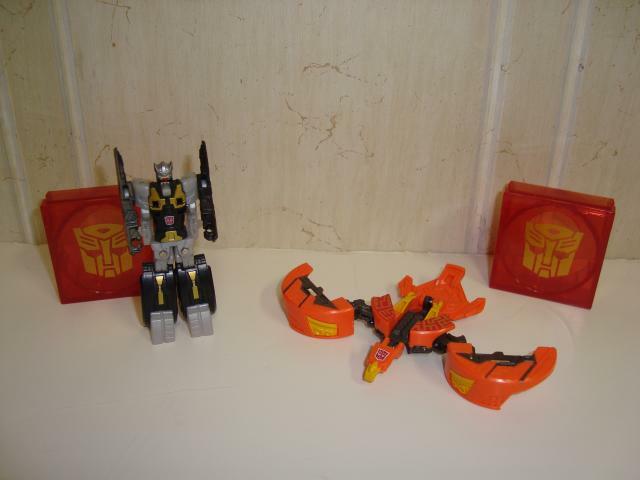 Sunder is the only one of the entire group that originated from the Kiss Players line under the name Sundor, as an orange Laserbeak redeco. As for these toys, most people would want to know if they should spend their hard earned money on them or not. Rewind�s alternate mode is a data disc. 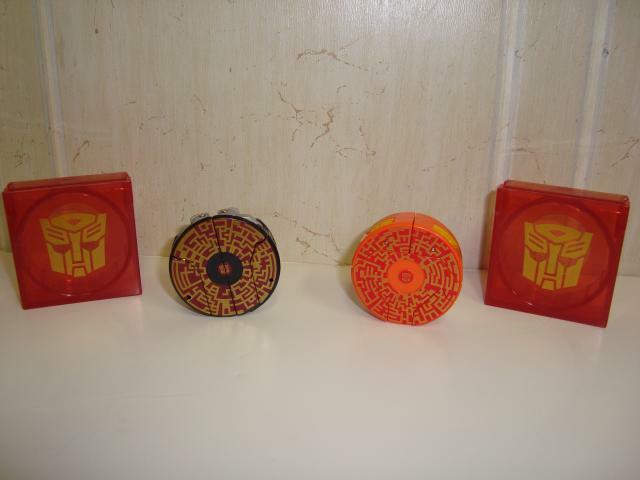 Rewind is the black disc in the Autobot pantheon; the plastic is black with some digital detailing done in red and gold with a small Autobot symbol in the middle. The disc itself is about a half-inch tall and about 1.5 inches in diameter. As with all the data discs, they can fit inside any of the FoC Voyagers named Blaster, Soundwave, or Soundblaster. There�s not much else to describe here, it�s just a disc! The nice part of these discs is their ability to auto-transform with the push of a button. To get Rewind into robot mode, all you have to do is press a small button on the bottom side of the disc. Once you let go, Rewind quickly snaps open, at which point he will mostly auto-transform into robot mode. It�s fun and quick, and Rewind easily snaps back into disc mode with a little fiddling. The not-so-fun part is having to rotate his arms down and pull his feet out to get him fully transformed; remember, I said he mostly auto-transforms. It�s not a deal-breaker, but Rewind looks quite funny when ejected into a flying belly-flop position. Rewind is much like the other disc bots with a fair bit of molded detail. It�s kind of surprising the difference in detail between Rewind/Eject and Frenzy/Rumble. The torso, arms, legs, and head all have different designs compared to the Decepticons; Hasbro could have easily just changed the head and left it at that. For paint apps, in my opinion Rewind/Eject are the true winners over Frenzy/Rumble. Rewind is done in black plastic, but he has silver grey shoulders, head, thighs and feet, with gold details on the lower legs, chest, and abdomen. There�s a tiny red & white Autobot symbol in the middle of his abs, and he even has a painted visor and faceplate. For such a small figure there�s a surprising amount of detail between molding and paint applications. Articulation is just like the other discs of this type - his shoulders swivel. Done! Overall, Rewind is a well done figure. Sunder is a straight repaint of Laserbeak, who came packed in with Soundwave. That�s definitely not a bad thing; Laserbeak is a fine Legends class figure. The disc mode has some decent molded detail around the bottom edges and sides, and is done is a beautifully bright orange color. The digital detail on the top of the disc is done in red and gold with an Autobot symbol in the middle. I blends a little bit too much, but the color choice isn�t terrible. Press a small button on the disc underside and let go � Shazam! Sunder springs to life! This figure fully auto-transforms, with no parts to separately move once opened up. The mechanism works very well, and switching him back and forth is quick and fun. The detailing in this mode is well done too, with panel lines and little mechanical marking everywhere. The orange is broken up well with black plastic that makes up the neck and inner wings. There�s a sizeable red & white Autobot symbol on the head as well. Sunder is a fun little figure, who apparently fancies dubstep. You can get the full experience by flipping him back and forth while jamming to some Skrillex. Transformation Design: 5. They auto-transform rather smoothly. Durability: 7. Spring mechanisms may fail in years to come. Fun: 7. They transform well and snap back together easily. Fun to switch to and fro. Aesthetics: 8. Paint apps and detailing are very well done for Legends figures. Articulation: 3. Not much articulation on these guys. Value/Price: 7. Two figures for ~$10 USD, and good looking ones too. Overall: 7. These two work well via auto-transformation, and the paint apps and detailing are good. Outside of that, they don�t offer too much on their own. Get them as a set with Blaster and this score jumps a point or two.